For the first time I went to the longest and biggest book fair in the country. Finally! Last September 17, I braved the crowd on the last day of the Manila International Book Fair 2017. I left the kids at my parents house before I took jeepneys going to SMX Convention at the SM Mall of Asia. I got to the venue before 10:30AM and I was shocked with the long queue outside. It took me an hour and 10 minutes before I got to enter the venue. Grabe ang daming tao! Ilang ikot yung pila! Good thing I left the kids. Pero naman if you got kids, they let you pass on a special lane. Still, not a good idea to bring small children at this crowd. Buti talaga iniwan ko sila. Ayun, amoy construction worker na di naligo ang peg ko after that long and winding pila. Nakakaloka. Mall-wide sale din kasi si SM MOA kaya blockbuster ang tao. I was already hungry and thirsty when I got inside but after seeing the crowd at the food concessionaires, tiis gutom muna ako. Haha! It took me less than 2 hours to roam around the ground and second floor exhibits. The second floor was dedicated to children's books hence this is where I first went. 2. Kiddie scissors for Php15 each. I forgot what is the regular price but I know I got these for at least 70% off. For Richer and For Poorer. Yes! I got books for myself. Wooohoo! These are my best buys for the day, I think. I got these books for just Php100 each. They had a bundle sale of 10 Chinkee Tan's books for 1K only instead of 3K. I would have bought the bundle but I didn't have the budget anymore since this was one of the last booths I checked before I went home. Sayang. 4. Another book I got from the 100-pesos All Books booth was the Veggietales 365 days Devotional for Boys. 5. Bee Series books were at 20% off each at the OMF Literature booth. Regular price is Php80. I got the Bee Safe, Bee Polite, Bee Helpful, and Bee Healthy books. 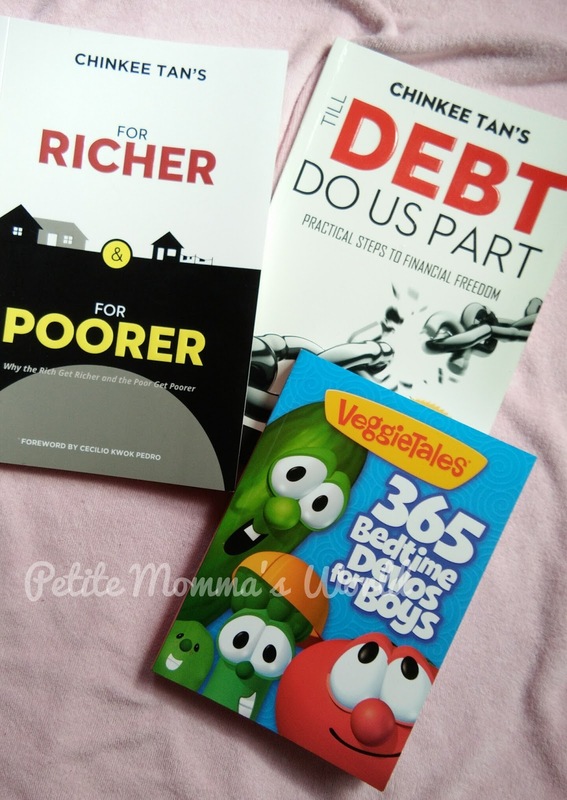 I was particularly looking for books that focus on character-building and I am so happy to have these. 6. Another book I got from the OMF Lit booth is the Meet My Super Dad storybook by Maricel Laxa-Pangilinan. This was also priced regular at Php80 and I got a 20% off for this purchase. 7. From the Adarna Publishing booth, I purchased only 1 storybook which is Halu Halo Espesyal. This book is available in two languages, English and Filipino. Sorry I already forgot how much I got this, but it was a big discount. I intended to get only 1 storybook from Adarna because we have many books from them already from the warehouse sale last year. I'd probably wait for another warehouse sale to get new books since we donate some of those. 8. Two more books for bigger kids (10 years old and above) are the What Kids Should Know About Andres Bonifacio and the Katipunan and What Kids Should Know About Filipino Architecture. They may be too advanced for my 6-year-old but these were on sale for Php50 from the regular price of Php115. How could I not resist? Hehehe. 9. From the booth of Museo Pambata, I got two books from the When I Grow Up Series. I bought When I Grow Up I Want to be a Police Officer and When I Grow Up I want to be a Firefighter. Books were sold at Php70 each. I liked that these books are also available on dual languages - English and Filipino. 10. From the Lampara booth, I only got two books since they were selling them at regular prices and you only get to avail of the discount if you have a Precious Pages app on your phone. Which I didn't have. I bought Jepoy Dyip's second book in the series for Php159.75. And an Easy To Learn (ETL) Comprehension Workbook for Php59.75. Overall I got 19 items and spent around Php1,200. Not bad di ba? I planned on getting cloth books for Z but it turned out their prices at the book fair was just the same, if not higher, than online stores. I also didn't like the available designs I had. So ayun, di ako bumili. There were great finds and if I had more time AND budget for sure I would have brought home more. Next time, I'll try to visit on a weekday. Kaso naman kasi ang traffic sa EDSA and C5 going to and fro MOA is a living nightmare. So next year pipili ulet ako between traffic ng sasakyan or traffic ng tao. Haha! 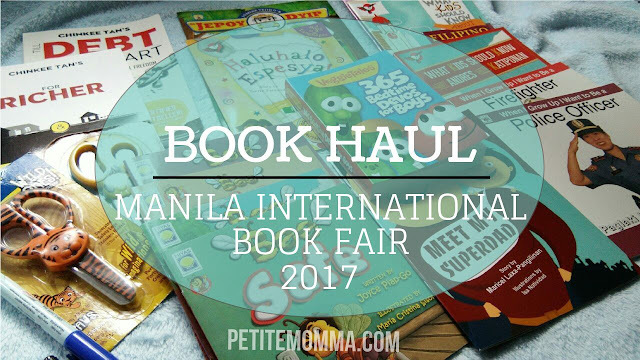 Were you able to visit the book fair this year? What great finds did you get? 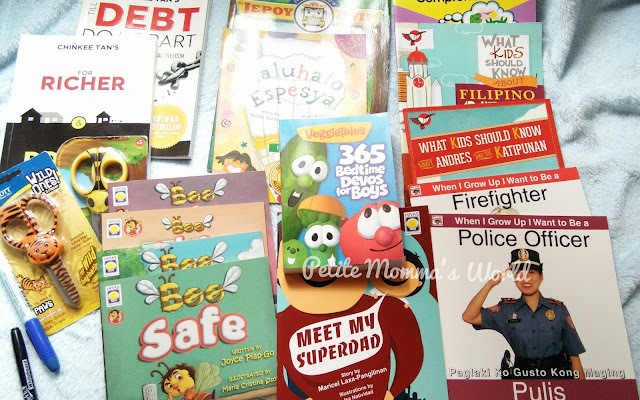 Sana hindi lang sila sa Moa nag Sale sa ibang branch din like dito sa Fairview.. Mahilig kasi sa books ang anak ko.. Grabe super laki ng natipid mo moshie..
Magkaiba po ang book fair sa sale ng SM MOA. Yung books, asa book fair ng SMX convention, not sa mall.